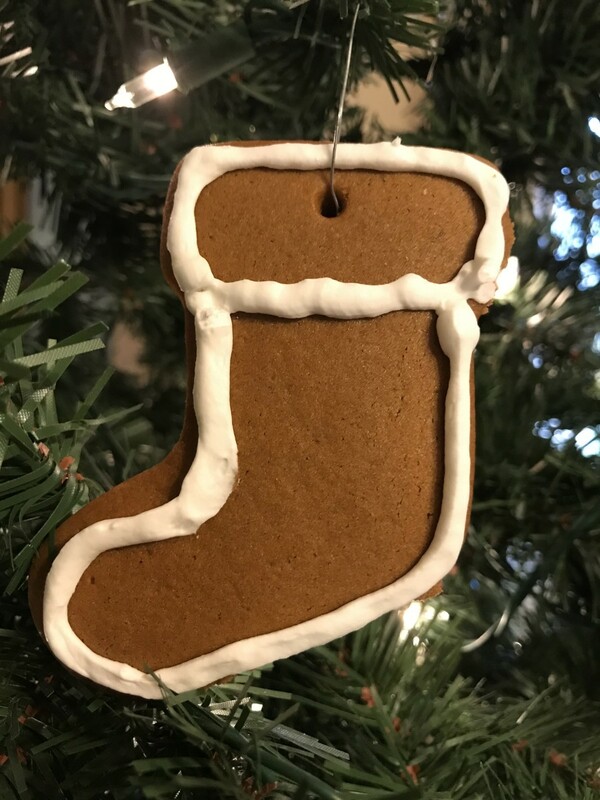 Although good enough to eat, this recipe for gingerbread ornaments is also sturdy enough for gingerbread projects, such as these cute edible ornaments or for building a gingerbread house. When the oldest children were really little, I would make these little ornaments and hang them on the tree Christmas Eve after I wrestled them all into bed. As they got older, they joined me in the project, in turn helping surprise the youngest when they awoke Christmas morning. A tree hung with cookies and candy canes has been our Christmas morning tradition for years. My youngest is still the most excited about that part of Christmas morning. Now they help me, which is even better. They pick the shapes they want (a dachshund-shaped cookie is the most popular in honor of our dog, Boudin Choux). I let them loose with the icing, and they have a ball. There aren't many activities appropriate and fun for all the kids but this is one where they all get in wholeheartedly (Currently aged 8 to 21). That's THE BEST PART OF IT. I'll never be a Pinterest rock star, but I do know how to create fun memories with kids, and this is one of my favorites. How awesome is a tree covered with cookies and candy? 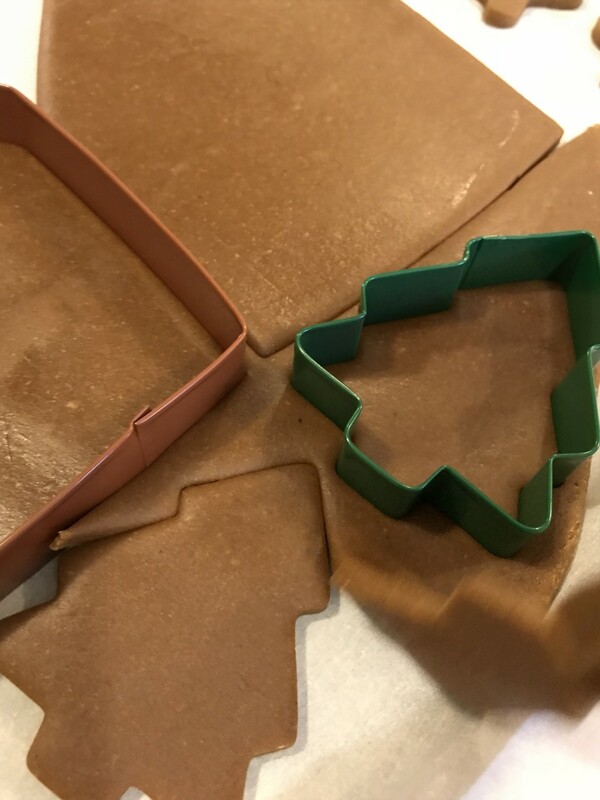 And these are easy - the dough is easy to make, forgiving to work with, and if you keep the shapes simple, they'll look great even if you have zero skills as a decorator. Trust me - I have zero skills there. So this is simply about the fun. Own the fun, and the mess and the giggles. And the fact that every single kid that helps you will - without exception - take shots of icing right out of the piping bag. Every. One. A couple of notes I've learned over the years. Toddlers tend to just lick off the icing, so watch for soggy cookies dropped in odd places. Dogs LOVE a tree hung with cookies, so there's that. And if you have cats, well. If you have cats you know about cats and Christmas Trees, so plan accordingly. All of those things are just part of the fun, so just remember you're after the story your family will tell in years to come. Now go make a mess. And enjoy it. Preheat oven to 325F. 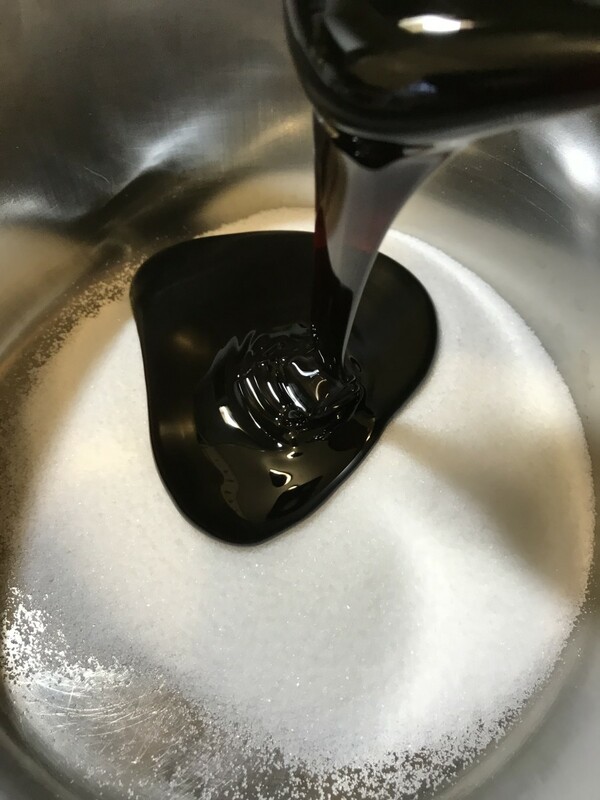 In a large saucepan over medium heat, melt together the sugar and molasses. Use a pan larger than you think you'll need since the hot mixture will expand quite a bit. Add all of the spices, and stir well. 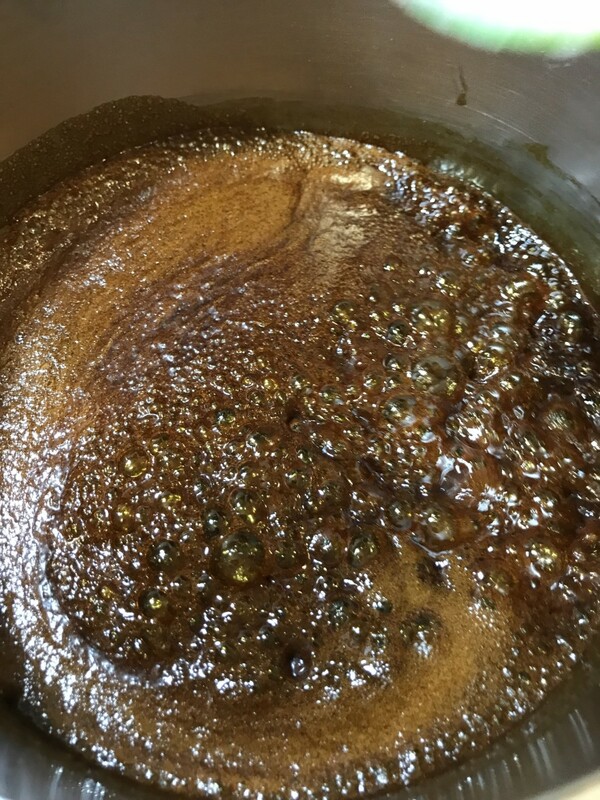 Bring the mixture up to a boil, and boil just until the sugar is completely dissolved. Remove from heat. Stir in baking soda. The stuff will foam up and expand at this point, so work carefully and give yourself plenty of room. You don't want to get the hot sugar on your skin! 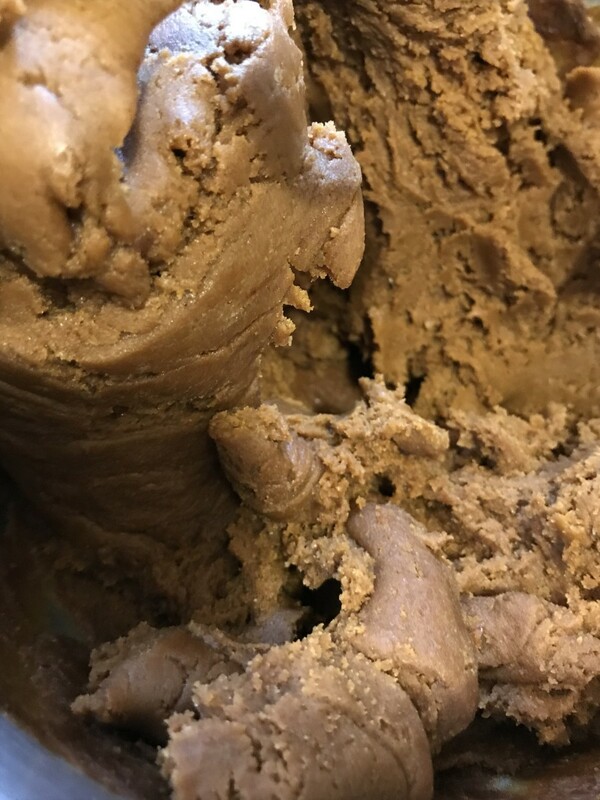 The mixture will have a bit of a strange, sticky texture at this point which is just fine. That's what you want. 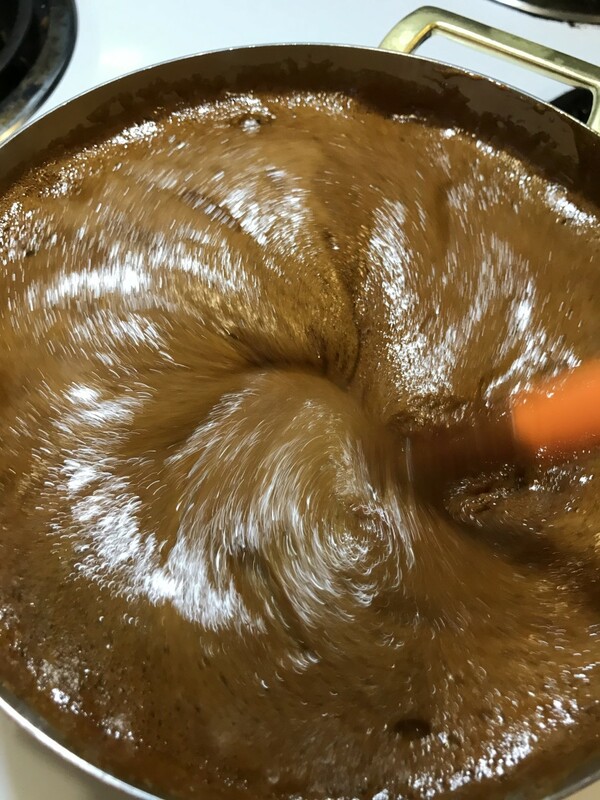 Transfer mixture to the bowl of an electric mixer. Turn the mixer on, and add the eggs one at a time. 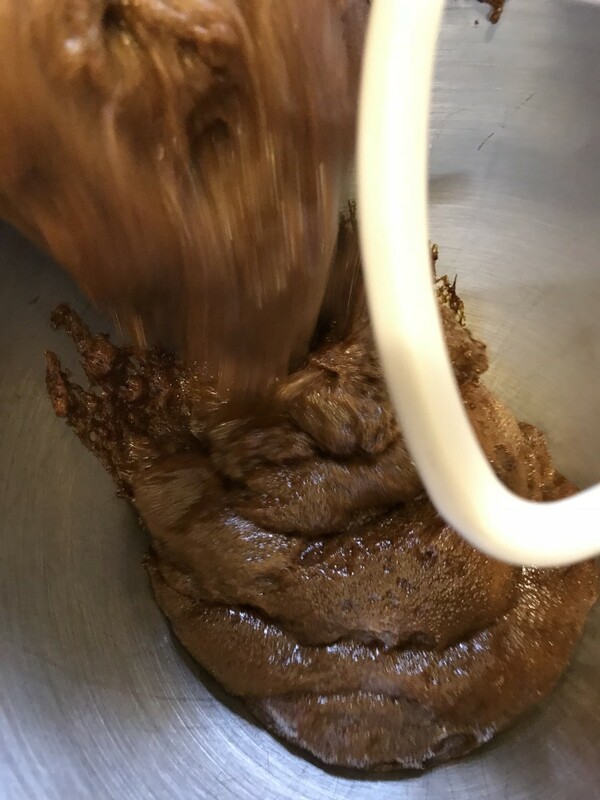 Working in batches and scraping down the side of the bowl as you go, add the flour, and mix the dough just until it's fully incorporated and the dough is smooth. Turn the dough out onto plastic wrap, and cover. Let it rest for about 30 minutes before rolling it out. Roll the dough out on a sheet of parchment paper to about 1/4 of an inch thick. Cut whatever shapes you like. This dough puffs a bit but not too much, so it's ok to work with more detailed cookie cutters. I like to keep them simple though - it's easier to pipe royal icing that way. But if you're much better at piping and icing than I am, knock yourself out! 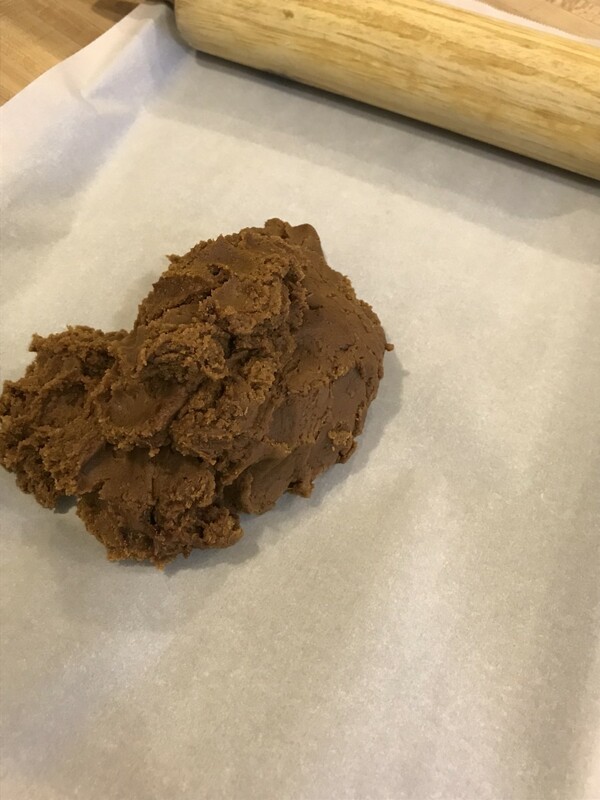 Pull the excess dough out from around the cookies before moving the cutter. The extra dough can be re-rolled and reused, and this keeps the shapes from distorting. Once cut, use a skewer or toothpick to put a small hole in the cookie for the ornament hangers. Do it before you bake it. The cookies are nice and sturdy, which means you can't really do this after baking. The hole stays in place, making the whole thing much, much easier. Keeping the cookies in place on the parchment paper, slide the paper onto a baking sheet. This also keeps the cookies from distorting and helps them keep their shapes. Bake for 12 minutes. Let the cookies cool for just a minute on the baking sheet, then transfer them to a wire rack to cool completly. This lets them set a bit before moving them, which also helps them keep thier shapes nicely. Once cool, pipe with royal icing in whatever designs you like. Again, I keep it simple and easy and usually just make outlines. I do use piping bags, but plastic ziplock bags work just fine too. 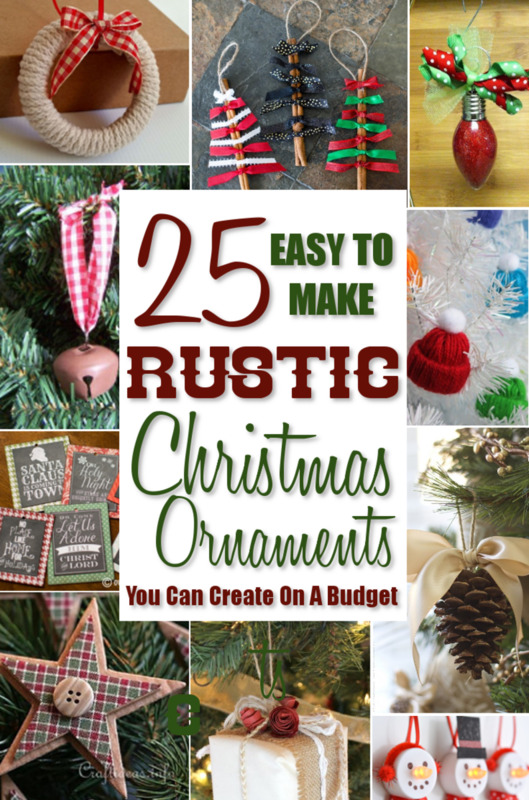 Let the icing dry, and you're ready to hang them on your tree! 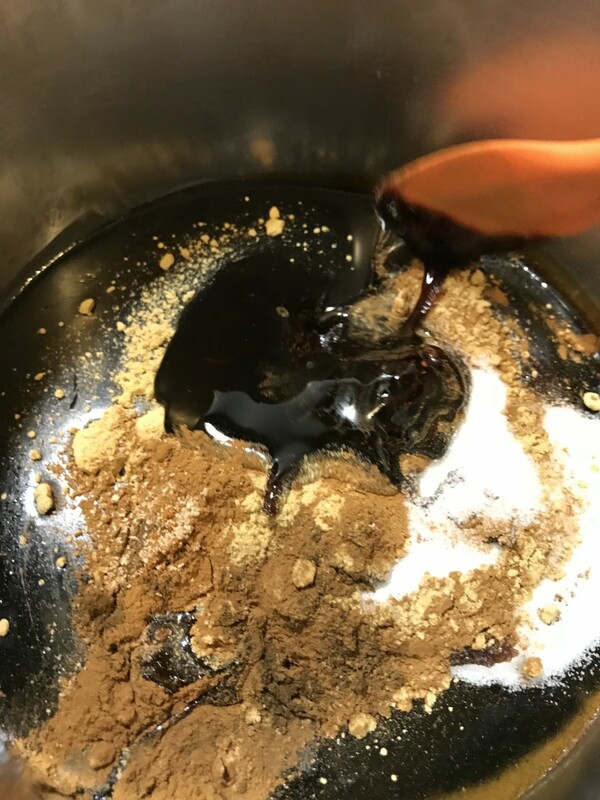 To get a sturdier gingerbread, this recipe starts with boiling the sugars and spices - in this case equal parts molasses and sugar. 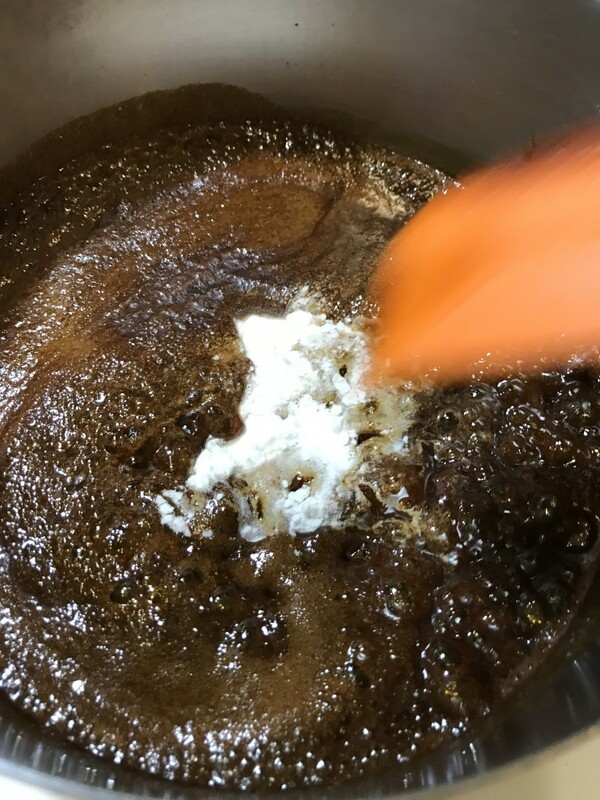 Look for plain molasses, not blackstrap molasses. The spices in these ornament cookies are classic, and they smell incredible as well as making the cookie ornaments taste great. Cinnamon, ginger, cloves and nutmeg make a great combination. Bring the sugar and spices to a boil, and let it boil for just a minute. All you need to do here is dissolve the sugar. 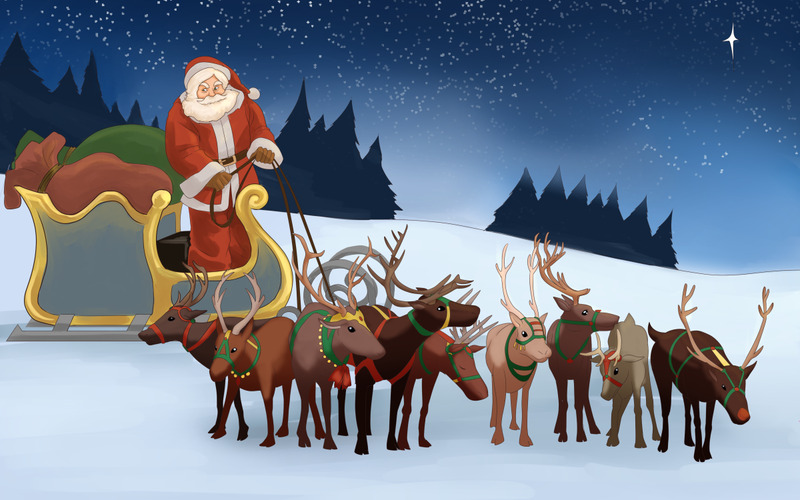 Be careful - boiling sugar is dangerous, and if it hits your skin, you'll NOT have a Merry Christmas. Add the baking soda - this will give the cookies some lift. It will also keep the cookies from turning into concrete, which would be fine if you want to keep them forever, but not if you want to keep your teeth if you eat one. The baking soda will make the mixture foam up, to a bit more than double in volume. This is why you want a saucepan much larger than you think you need. You don't want liquid sugar overflowing the pan. Impossible to clean, and worse - dangerous. You'll need a cup of butter. I use salted, but use what you prefer. I don't know why I started to melt the butter - completely unnecessary. It'll melt just fine in the hot sugar mixture. 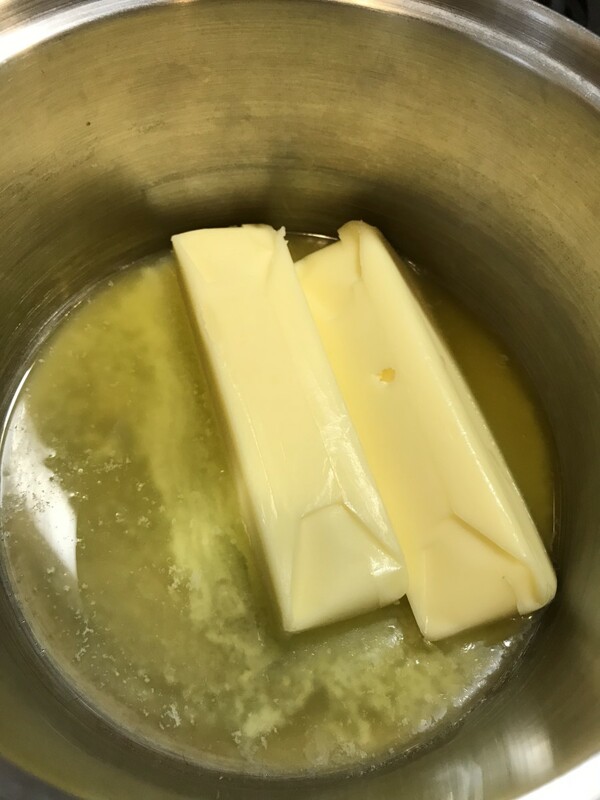 Transfer the sugar/butter mixture to an electric mixer. It has a rather strange texture at this point, which is fine. You can work by hand at this point, kneading in the flour, but you'll need to be a lot less lazy than I am. 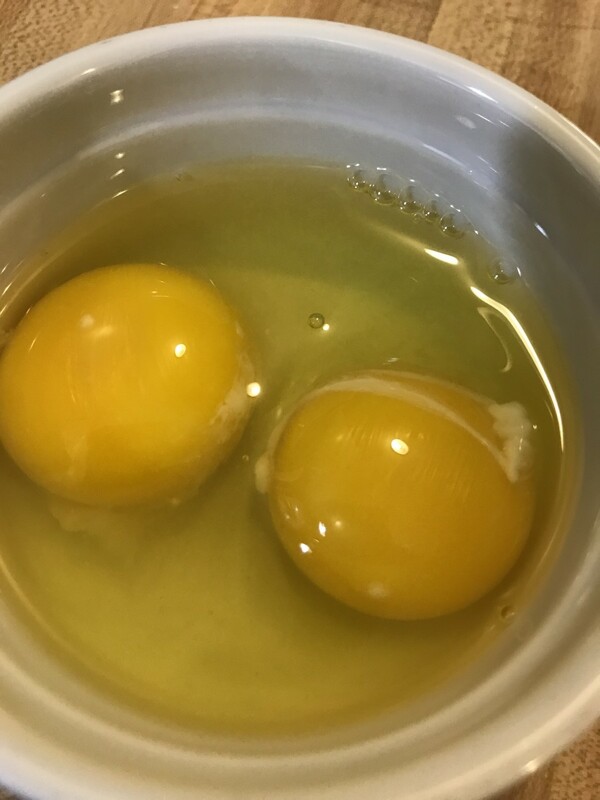 I like to start the mixer and let the sugar/butter mixture cool a bit before adding the eggs, so the eggs don't cook in the dough. Use large eggs at room temperature. 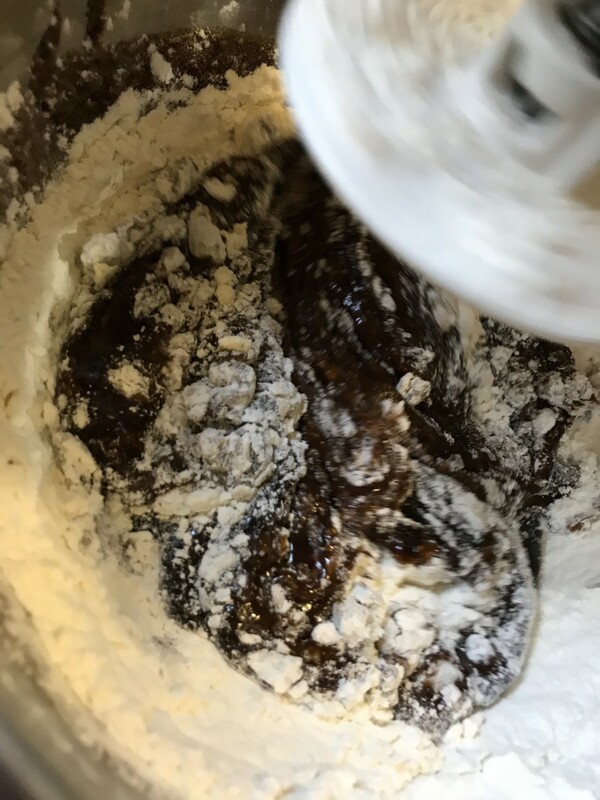 I use a dough hook on the mixer, and add the flour in about three batches, to make it easier to scrape down the sides of the bowl. This is a heavy dough, so patience pays off. Just keep kneading (or mixing) the dough until the flour is completely incorporated and the dough is smooth. Then turn the dough out onto a sheet of plastic wrap. Wrap the dough and let it rest about half an hour. You don't have to chill it - it's fine at room temperature. When you're ready to roll it out, divide it into pieces that are about a third. This is a nice dough - no flour required for rolling. But I do like working on parchment. 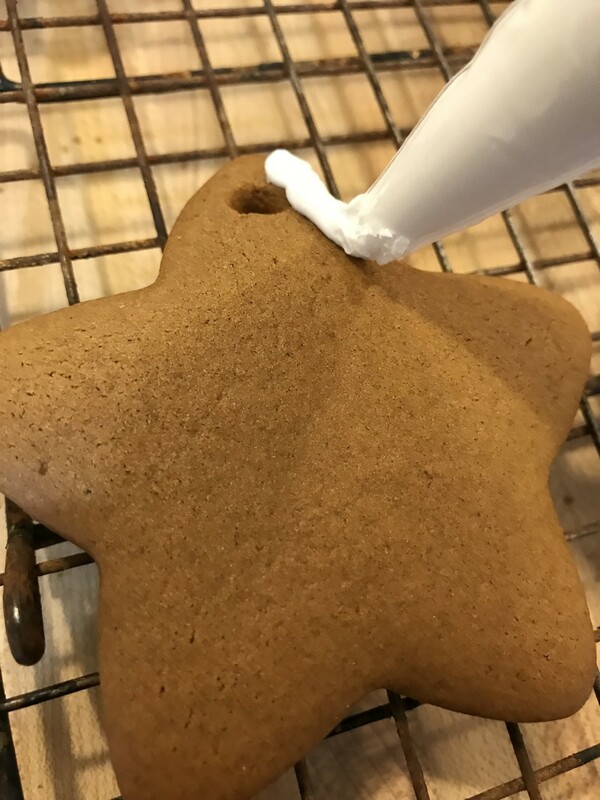 This means you can cut the cookies out, and slide the parchment onto a baking sheet when ready, keeping the ornament shapes intact. Roll the dough to about 1/4 inch thick. This part isn't exact - don't worry too much. You do want a nice sturdy cookie for the ornament, so don't roll too thinly. The easiest way to cut clean shapes is to cut on the parchment, then remove the dough from around the shapes. The extra dough can be rerolled. 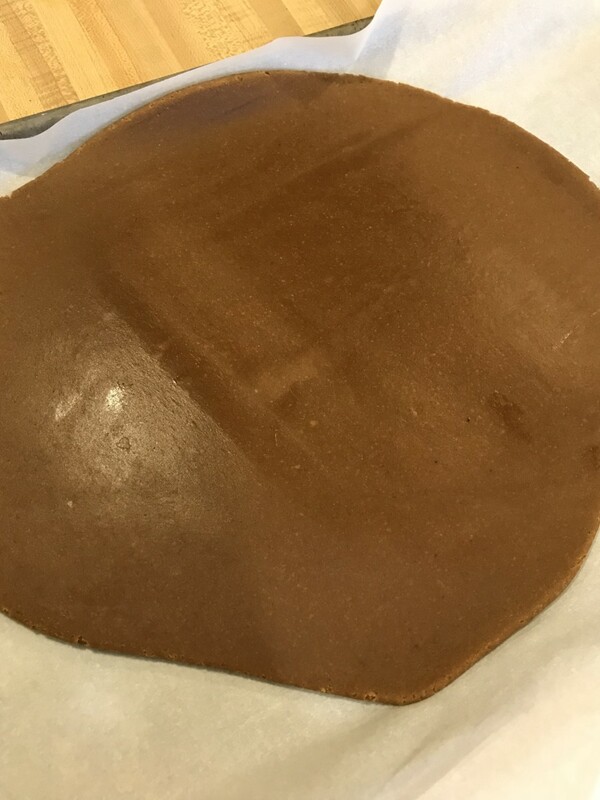 Keeping the cookies right on the parchment means you can move them to the baking sheet without distortion. 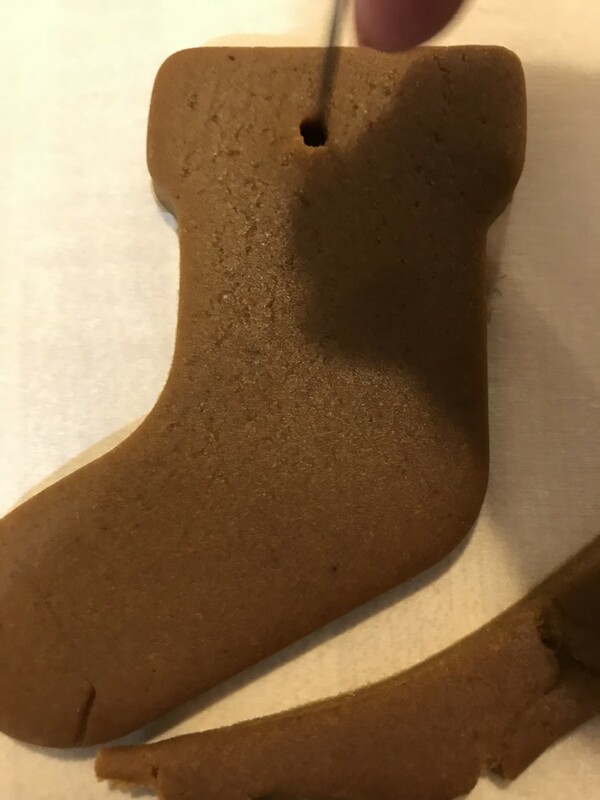 Use a toothpick or small skewer to make a small hole in the top of the cookie ornament for hanging. Do it before baking or you'll never get it right without breaking the cookie. The cookies puff just a touch, but not much, so the hole stays in place. 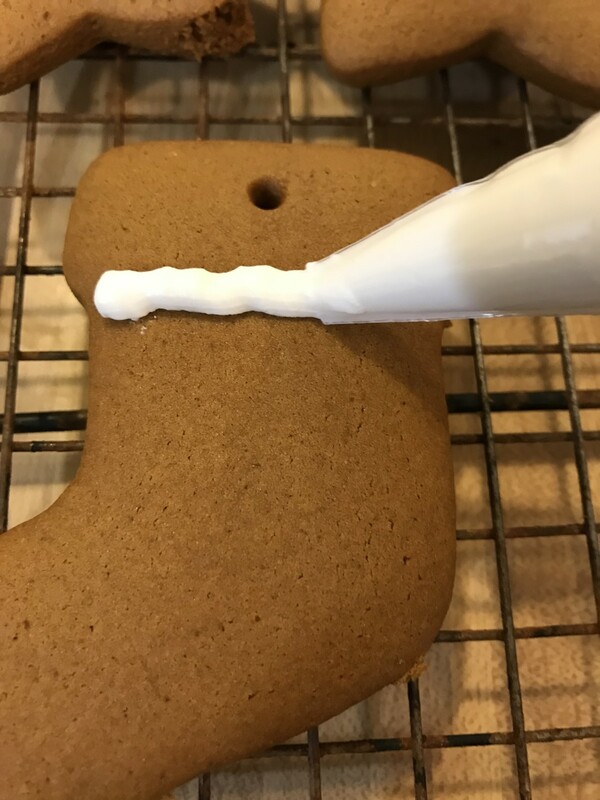 Royal icing is easy to pipe (see - I didn't even use a piping tip), holds its shape beautifully, and drys very hard. No icing mess on the finished cookies! The whole point of this project for me and the kids is to have fun and make memories. We aren't after Television Bake Off results, so we keep it easy. Even small kiddos can pipe and have fun. But you can add sprinkles or color your icing if you wish! Once Dry - Hang them Up! Cute and FUN! This turned into a fun project for the entire Horde, from the youngest to the teenagers. That alone makes the whole thing worth doing. 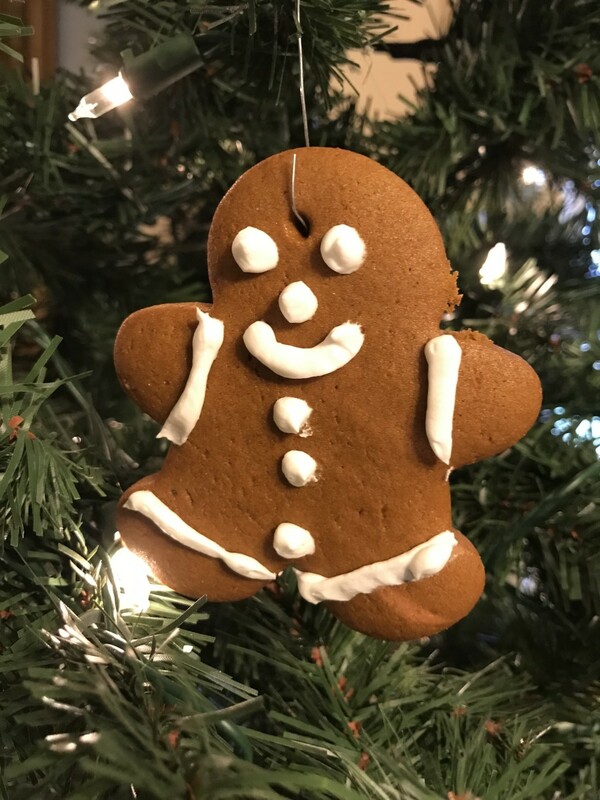 My youngest son is already telling his friends how "mom made the BEST gingerbread". #Supermom. 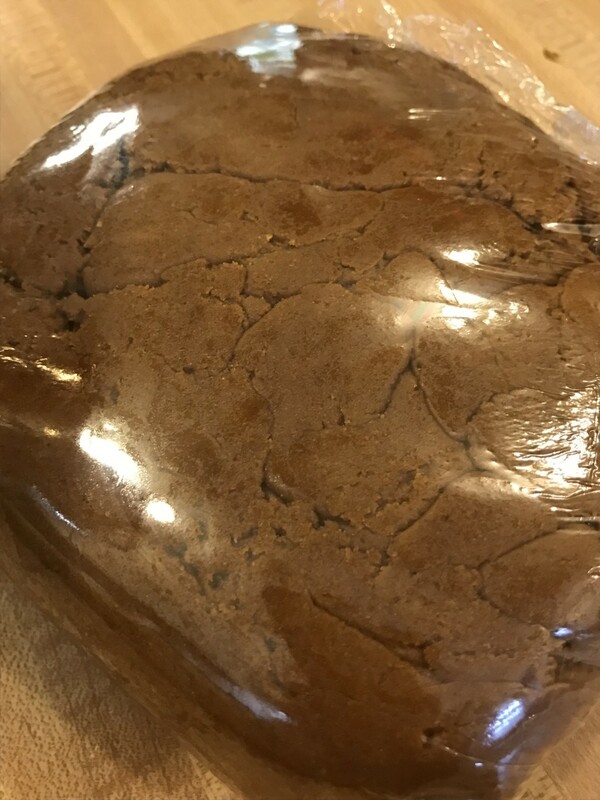 Donna - this is the exact same dough I used to make our gingerbread house. As Jill mentioned it is nice and heavy, but as it dries it's nice and sturdy, and never gets too 'hard'. It does stay a bit softer than most. I'll be posting our ginger bread house soon, it works well for those of us who are NOT great decorators, which is why I love it! The dough does look very heavy, but the cookies themselves look tender and chewy rather than crisp. Really nice. 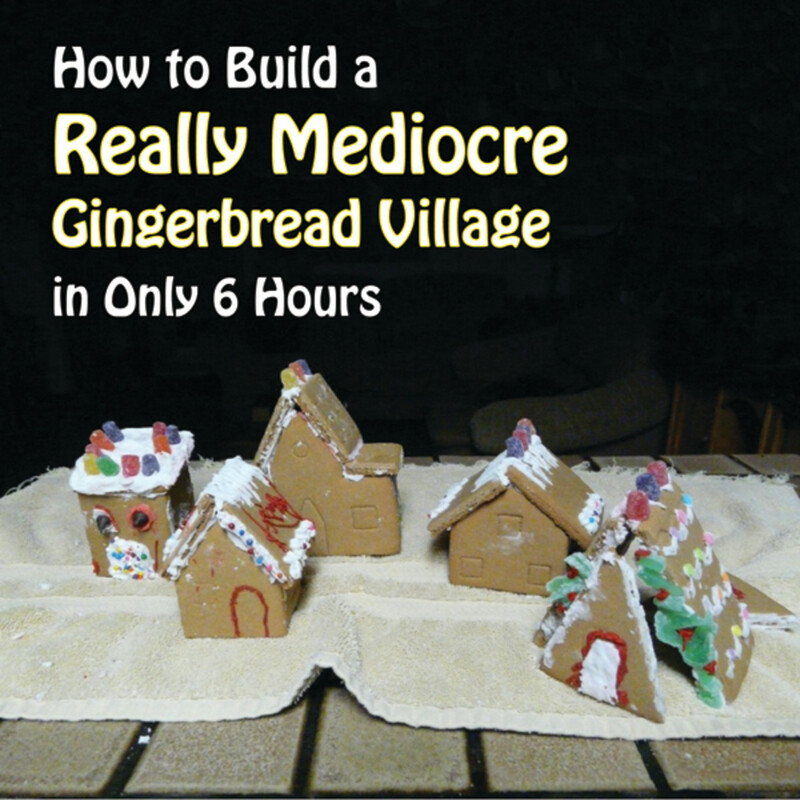 I'm planning to make my first gingerbread house next year. I've thought a lot about the design and look I want for my house (though too late for this year), and I'm excited to build and decorate it. Pinning your recipe and advice for next Christmas season. Thanks for sharing!